"The library is not a shrine for the worship of books. It is not a temple where literary incense must be burned or where one's devotion to the bound book is expressed in ritual. A library, to modify the famous metaphor of Socrates, should be the delivery room for the birth of ideas--a place where history comes to life." As an indispensable, partner in the academic enterprise, the Library provides a diverse IITTM community with the information resources and services fundamental to learning and the pursuit of knowledge. ERC Bhubaneswar has a resourceful library, one of its kind in travel and tourism education in Eastern India. The Library fosters an environment in which students, faculty, and staff can become informed citizens who are committed to learning and to the spirit of inquiry. 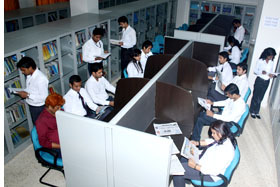 The Library has an unique collection of 7000 books of various publications, encyclopaedias, dictionaries, classics of world literature, full text journals. It also receives various Newspapers, Newsletters and has Annual Reports from public and private organizations. A wide range of CDs based on travel and tourism themes and those received with books are also available. Online journals are also made available through the Institute’s intranet. except Saturdays, Sundays and Public Holidays.